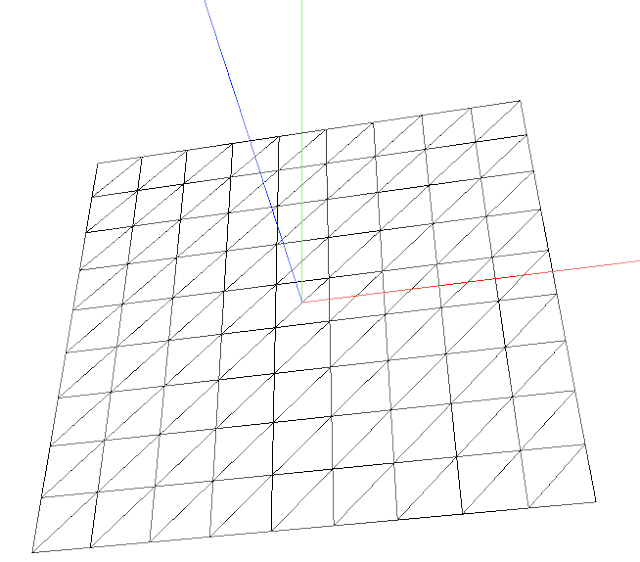 From heights stored in an array to a triangle mesh. The vertices are at the corners of the triangles. 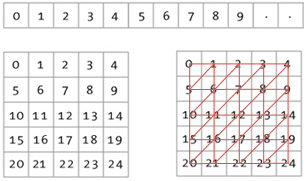 Each vertex has a X/Y/Z position. The red line is the X axis, the green line is the Y axis and blue line is the Z axis (height). 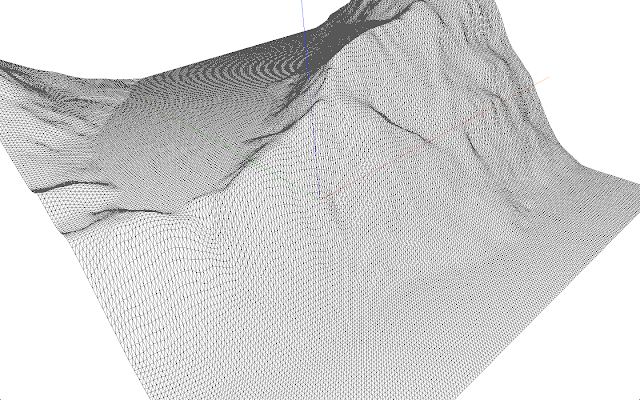 So we got our 3D landscape with just a few lines of code (available on GitHub). In the next blog post we'll add some texture to make it more realistic. Great series of posts - looking forward to the next one on texturing the 3d model. I've also really benefited from your post, so thank you. Did you consider using shaders for the texturing, and if so why did you decide against it? I don't know enough about shaders to be able to use it. Please share your experiences if you give it a try! Great series, thanks for posting! I'm curious if you've seen Cesium? Here's a terrain demo. We'd love to have you as a contributor! I'm very impressed by your work on terrain rendering in Cesium! If I should recreate this example in Cecium, what would be the best/easiest way to add heightmaps and textures? Should I install a Cecium Terrain Server or implement my own TerrainProvider interface? It would be nice if I could just pre-render a set of heightmap/texture tiles and serve them directly. Is it possible? Yes, you have the right idea. To get terrain data into Cesium, you can either create a tileset in a format supported by Cesium, or you can implement a custom TerrainProvider to access the terrain in whatever format it is in. The tile format expected by CesiumTerrainProvider is documented here. Cesium also supports loading terrain from an ArcGIS Server or VR-TheWorld server out of the box, but unless you happen to have one of those already you're probably better off with the CesiumTerrainProvider. 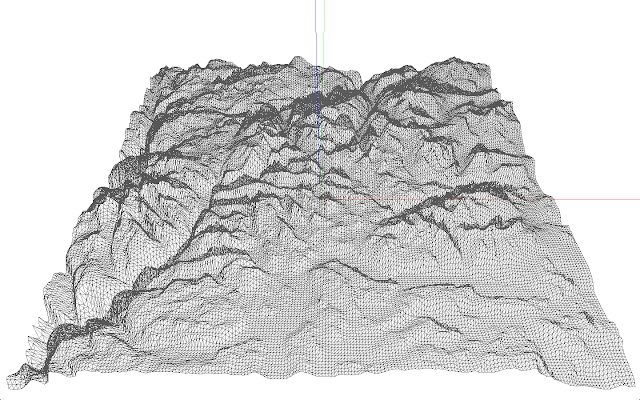 If you'd prefer to write your own terrain provider, the best way to learn how to do that is to take a look at the source code for CesiumTerrainProvider. The situation is similar for texturing. You can either use one of the already-supported imagery providers, or write a custom implementation of the ImageryProvider interface. Looks good Kevin! Would be even better if we had a tool like gdal2tiles to generate the .terrain tiles from a DEM. Any plans for a tool like this? There are some folks working on modifying gdal2tiles.py to generate terrain tiles. See here. My own goals are a bit more ambitious. I'm working on a terrain server that allows users to easily import their own terrain data and process it for use with Cesium. The terrain tiles created by this server will be triangle meshes rather than heightmaps, which allows for both faster and more accurate terrain rendering. The format of these mesh tiles will be open and published as well, but the server itself will be a paid product. This is a way for AGI (the company I work for) to recoup some of the massive investment it has made in Cesium development. We welcome and encourage other solutions from the community, though! Yes, streaming terrain tiles as TINs will be more efficient. Please notify me when the tile format is ready - or make a post on your blog. thank you for all your posts. I try to redo the whole thing by myself. Actually I was able to build the binary file with GDAL but I have some trouble with the the webGL grid generation. I downloaded the file master ZIP, so I have something like that on my desktop. but when I try to execute the html with chrome only "plane.html" is working well. Do I need to modify jotunheimen.html and besseggen.html for a desktop execution ? I'm not a java expert and I don't know how to see in which line the code is breaking. Should I use something like Eclipse ? I have read here and here that the BAD_URI error was added into the XMLHttpRequest object by browser editor to improve web security. So, perhaps you have any ideas to fix the problem or to load the data in the browser ? very nice examples. But what strategy should be used to support much larger datasets? Is there any limit for number of faces? I tried to increase mesh size and FF crashed. It looks like some WebGL or GPU limit was reached. But which one and how to work around? I saw some level of detail strategy but they are quite complicated and need support on server side. Vincent: You need to access your files through a web server. Michael: You need some sort of LoD-algorithm, and I haven't found a decent solution for three.js yet. Have a look at this blog post.